Chris McGrath/Getty ImagesJamal Khashoggi disappeared after entering the Saudi consulate in Istanbul in early October. Senior Trump administration officials dodged a question on US support for Saudi Arabia as they announced new sanctions against Iran. 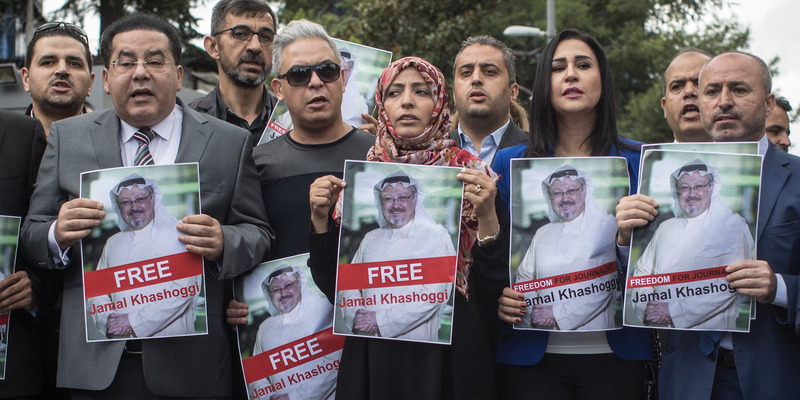 The developments came amid the ongoing investigation into the disappearance of Saudi journalist Jamal Khashoggi. The sanctions target Iran’s Basij Resistance Force, which is accused of using child soldiers. “Normal governments don’t recruit, indoctrinate, and use child soldiers,” the officials said in reference to Iran’s Basij Resistance Force. While taking questions from reporters, the officials were asked if they considered it “normal” for a country to “murder” a journalist in a consulate. Senior Trump administration officials on Tuesday dodged a question on US support for Saudi Arabia as they announced new sanctions against Iran. The developments came amid the backdrop of an ongoing investigation into the disappearance of Saudi journalist Jamal Khashoggi. “Normal governments don’t recruit, indoctrinate, and use child soldiers,” the officials said during a phone call on the new sanctions, echoing recent comments on Iran made by Secretary of State Mike Pompeo. As the officials took questions from reporters, they were asked whether they also considered it “disgusting” for a country enters a consulate and “murders” a journalist and if they would characterise that as “normal” behaviour, a reference to accusations that the Saudi Arabian government orchestrated the killing of Khashoggi. Khashoggi disappeared after entering the Saudi consulate in Istanbul on October. Turkish authorities allege he was killed by a 15-man hit team sent to interrogate him under the direct orders of the highest levels of the Saudi government. Some reports have suggested the orders came from Crown Prince Mohammed bin Salman, of whom Khashoggi had been critical of in his reporting. On Tuesday, a Turkish official said police had found “certain evidence” Khashoggi was killed in the consulate. But Trump in the past few days has repeatedly emphasised Saudi Arabia’s denials of any involvement in Khashoggi’s disappearance and hasn’t expressed scepticism about their claims. …during the call, and told me that he has already started, and will rapidly expand, a full and complete investigation into this matter. Answers will be forthcoming shortly. Meanwhile, Secretary of Mike Pompeo visited Saudi Arabia on Tuesday, where he was seen smiling with the crown prince. The Khashoggi case has placed an uncomfortable spotlight on the relationship between the US and Saudi Arabia, a country that has long been decried for its human rights record. Even before Khashoggi went missing, the Trump administration was under pressure from members of Congress, human rights groups, and the international community to cease arms sales to Saudi Arabia as it continues to wage war in Yemen. It’s estimated the war in Yemen has led to at least 6,500 civilian deaths, including roughly 1,625 children, according to data collected by the UN human rights office. Bombs made in the US have been involved in strikes that have killed Yemeni children, including a recent strike that hit a school bus and led to deaths of over 40 children and wounded more than 60. From 2012 to 2016, the US was the world’s top exporter of arms, and Saudi Arabia was its No. 1 customer. Trump seems reluctant to cease this partnership, recently saying it would be a “tough pill to swallow.” He’s also not yet called for sanctions against Saudi Arabia, even as a bipartisan group of senators are pushing for the kingdom to be punished.